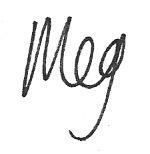 Hi, I’m Meg, the gal behind House Plans Helper. It will come as no surprise to you that I love jamming on home design and sharing my ideas and experiences. You know how there's loads of sites and blogs on interior design and decor? I love those too, but do you ever stop and think about the layout of your home (or future home)? The walls, doors and floors that are underneath all that beautiful wallpaper, paint, fabric and furniture? I do, and I couldn't find a website that talked much about home layout. There's lots of pretty pictures and courses on interior design out there, but I couldn’t find any websites or courses for the amateur home design enthusiast. That's why I built House Plans Helper. I want to provide a place that people could come to for information to help them through their home design projects. Just in case your were wondering, I'm not an architect, nor am I an interior designer. I wonder if I’ll come back as some sort of home designer in my next life! For now I'm all about encouraging you to learn about home design so that you can make better decisions about the homes you live in. So how did I learn about home design? I became interested in home design because I've lived in lots of different homes around the world (23 at the last count). It's just the way my life has turned out! Over the years I started wondering why some homes were so much nicer to live in than others. I started using design techniques from my background in software design and user experience to analyze the homes I'd lived in. I read every book I could find on home design (thanks to kind university librarians looking after various architecture libraries around the world where I’ve lived). I talked to design psychologists. And the fruit of all my learning and experience is here on House Plans Helper. 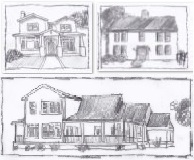 As you go through the site you’ll come across a few of my “sketches" – especially in the house styles section. They're hardly works of art (I don't think I'm a very good at sketching) but there is a big tradition in architecture for sketching – to show off the design so that color doesn’t start to influence your perceptions. You’ll also come across a few architecture quotes from my collection. I’ve put them in boxes so that you’ll know where I’ve found something brilliant – that someone else put so well. I also find myself writing little notes to you. It might be something in particular I want to draw your attention to, a piece of design I think is genius (or terrible), something I think we should talk about, maybe even just something from my own experience. So, with that little introduction, be my guest and enjoy exploring House Plans Helper!